Things to do in Gatlinburg- For Kids! When vacationing in Gatlinburg, many visitors look for something fun to do with their kids. There are a range of activities to participate in from hiking in the Great Smoky Mountains National Park to riding bumper cars in downtown Gatlinburg. There are many cheap or free things to do in Gatlinburg also if you are on a budget. At the Nantahala Outdoor Center right before the National Park in downtown Gatlinburg, kids can climb the rock wall while you shop for new camping gear. The NOC is a great place for the whole family. There are several Ripley’s attractions throughout downtown Gatlinburg including Ripley’s Aquarium in the Smokies with an interactive kids area, live mermaid diving shows and a specially designed kid friendly penguin exhibit, Davy Crockett mini golf, Ripley’s Haunted Adventure, Ripley’s Marvelous Mirror Maze and Candy store, Ripley’s Moving Theater, Ripley’s Fun Zone, and the famous Ripley’s Believe It Or Not Museum. Ober Gatlinburg also has a lot to offer not only in the winter months, but in the summer months as well. Ride the Aerial Tramway from downtown Gatlinburg up to Ober Gatlinburg and enjoy the best views of the Great Smoky Mountains. After you get to the top, visit the Wildlife Encounter where you can see Bears. While on your visit to Ober Gatlinburg spend a few hours Ice Skating, ride the Alpine Slide, the Scenic Chairlift, the Blue Cyclone Rapids water slide and Ober’s Lightin’ Raft Ride and Shoot-the-Chute. There is also a fun-filled Amaze’n Maze and a Kiddie Land and Rides for children. Gatlinburg also offers Zip-lining, Whitewater Rafting, hiking, biking, horseback riding and fishing spots. You may book zip-lining and white water rafting trips through the NOC in downtown Gatlinburg as well as rent bicycles for the day and get information about where to go fishing. The Sugarlands Visitors Center is also a great place to take your children for free where the whole family can learn about the history of the park and go through the wildlife museum inside the Visitors Center. Get information about the Junior Ranger program and the activities that your children may participate in for free. Cades Cove is also an excellent place to take your family in the park. Take a ranger led hayride through Cades Cove for $14.00 per person. Mynatt Park, one of Gatlinburg’s City parks, is near downtown Gatlinburg. Take the family to the park for a picnic lunch, to play in the river, play on the jungle gym, or even play a fun game of tennis or basketball. All kids live candy, so while downtown visit any of the local Candy stores where the candy is made on site. Watch Saltwater Taffy being made at Ole Smoky’s Candy Kitchen. Stay with ERA In The Smokies and easily access all that Gatlinburg has to offer for the entire family! 1. Driving Trails- Enjoy nature and view wildlife on these driving trails: Trail of the Dragon, Balsam Mountain Road, Cades Cove Loop Road, Roaring Fork Motor Nature Trail, Upper Tremont Road, Newfound Gap Road and the Cataloochee Valley. 2. 8 mile driving loop around the Arts and Crafts Community- With more than 120 working artisans this loop is the nations largest organization of independent artisans. 3. Historic Structures in the Great Smoky Mountains National Park– There are over 90 structures preserved or rehabilitated in the park. You can see them in Cades Cove, Cataloochee, Oconaluftee and the Roaring Fork Motor Nature Trail. 5. Sugar-lands Visitor Center- Pick up maps and see exhibits of Mountain life and culture as well as all of the different species of animals that can be found here in the Great Smoky Mountains National Park. 6. Outdoor Activities- Bicycling, Camping, Fishing, Hiking and Picnicking. There are many places in the park to enjoy multiple activities such as the Chimmeys Picnic area, the Greenbrier Picnic area, the Metcalf Bottoms Picnic area and Cades Cove. 7. Winterfest– This event brings the opportunity to meet new people, learn new skills, share ideas and compete against other posts and crews and have fun. 8.Smoky Mountain Harvest Festival– Beginning in September, the people of Gatlinburg celebrate the Autumn colors by decorating and entertaining guests and start out with the Fall Craftsman’s Fair. 9. New Year’s Eve Ball Drop– Celebrate the New Year at Gatlinburg’s 26th annual Ball Drop and Fireworks Show around the intersection of the Parkway in downtown Gatlinburg and the Historic Nature Trail at the Base of the Space Needle late Tuesday night, December 31, 2013. 10. Gatlinburg Festival of Lights Christmas Parade- Celebrate the Christmas season at Gatlinburg’s 38th annual Fantasy of Lights Christmas Parade at 7:30 p.m. on Friday December 7, 2013. There will be over 100 parade entries, helium balloons and marching bands from Tennessee, North Carolina, Virginia, Georgia and Alabama. When the weather cools off each fall, folks in the Smokies start looking for more ways to spend time outdoors. Cycling is a great option for all ages. Bicycles can travel on most roads within the Great Smoky Mountains National Park. However, due to steep terrain, narrow road surfaces, and heavy automobile traffic, many park roads are not well suited for safe and enjoyable bicycle riding. Always wear a helmet and use safety gear! Cades Cove Loop Road is an exception. The 11-mile one way road, is a popular bicycling area. It provides bicyclists with excellent opportunities for wildlife viewing and touring 19th century homesites. During summer and fall, bicycles may be rented at the Cades Cove Campground Store (located near Cades Cove Campground). For information on bicycle rentals and hours of operation, please call (865) 448-9034. Beginning the second week in May, the loop road is closed to motor vehicle traffic Wednesday and Saturday mornings until 10:00 a.m. to allow bicyclists and pedestrians to enjoy the cove. This closure continues through the second-to-last Saturday in September. Other areas suitable for bicyclists include Greenbrier and Tremont roads in Tennessee, and Lakeview Drive, and Cataloochee Valley in North Carolina. Cyclists may also traverse unfinished portions of the Foothills Parkway in Tennessee. Download a park map to locate these areas. Safety is always a major concern where cars and bicycles must share the road. The State of Tennessee requires that children age 16 and under wear a helmet. We strongly recommend that all riders wear helmets, use rear view mirrors, and ride properly fitted and well-maintained bicycles. Please obey all traffic regulations. There are no mountain biking trails in Great Smoky Mountains National Park. The Gatlinburg Trail, the Oconaluftee River Trail, and the lower Deep Creek Trail are the only park trails on which bicycles are allowed. Bicycles are prohibited on all other park trails. Special thanks to The Great Smoky Mountains National Park Page of the National Park Service site for providing great content on bicycling in the Park. This blog is sponsored in part by ERA In The Smokies Realty and Rentals located at 207 Parkway in Gatlinburg, TN. For more information on a Gatlinburg Cabin for your Smoky Mountain Vacation or all the reasons to move to the Smokies, call 1-800-309-0277. ERA In The Smokies is a leader in chalet and Log Cabin Rentals and Real Estate Sales in the Gatlinburg area. If you plan on visiting Gatlinburg, Tennessee, make sure to attend an event called Walk on the North Side. This small mountain village provides a great opportunity for you to get out of your car and walk. 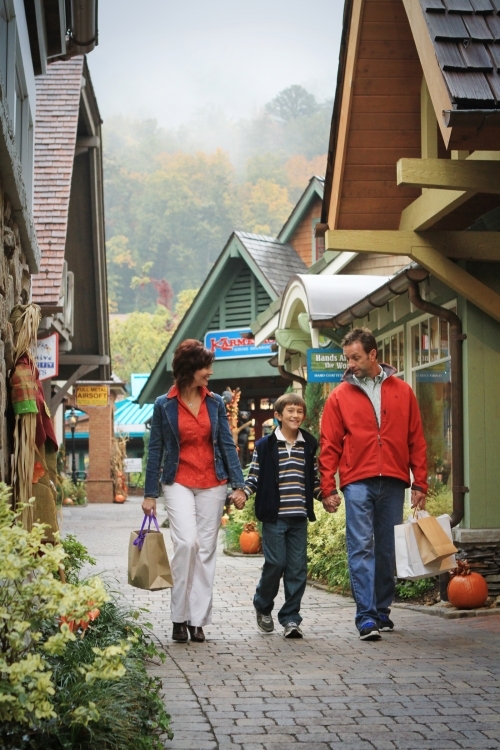 Enjoy the beautiful atmosphere while strolling through Gatlinburg. There are numerous shops and eateries that are only footsteps away. When planning your trip, consider staying in a Gatlinburg cabin. This quaint town is the perfect place for a relaxing trip. The Walk on the North Side occurs on the fourth weekend of every month. Make sure to plan your trip accordingly. This event features unique shopping, live entertainment and skill demonstrations. Along with that, the event also hosts children’s activities. Gatlinburg plans special events throughout the Parkway. For example, there may be wine tastings and artist demonstrations. 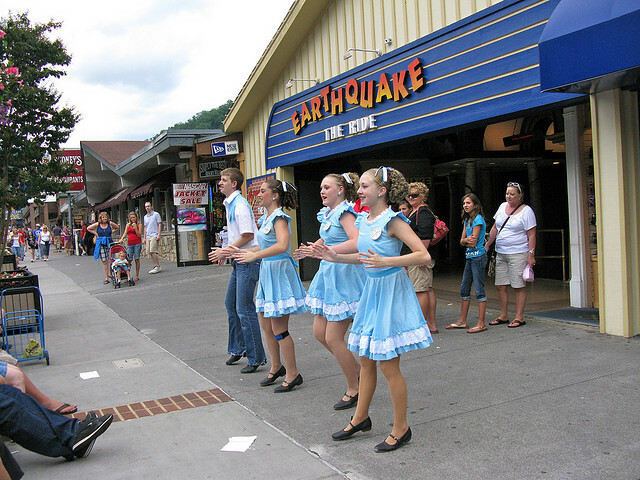 If you enjoy walking, Gatlinburg is the place to be on the fourth weekend of every month. It’s a picturesque town that has plenty of activities. Call ERA in the Smokies today to reserve your Gatlinburg Cabin so that you too can take part in the Gatlinburg Walk on the North Side activities! Take one day of your stay in Gatlinburg to explore the beauty of the nearby Blue Ridge Parkway! There are tons of interesting places to stop and stretch your legs! In fact, some of these sights could take up a whole day on their own! Here are a few noteworthy suggestions! “Grandfather Mountain inspires awe through an abundance of natural wonders. Designated by the United Nations as an International Biosphere Reserve and protected forever by the Grandfather Mountain Stewardship Foundation, there is nowhere else on Earth that you can enjoy such a variety of mountain life in one amazing place.” Open year round. Cades Cove is one of the most beloved areas of the Great Smoky Mountains National Park, and perhaps one of the favorite area attractions over all! In honor the Cades Cove Loop reopening on April 24, 2010, we would like to write about some of the things that make Cades Cove such a favorite! There are several trailheads that begin in Cades Cove: Abrams Falls Trail, Cooper Road Trail, Gregory Bald Trail, Gregory Ridge Trail, Hannah Mountain Trail, Indian Grave Gap Trail, and Rabbit Creek Trail. The various hikes provide many beautiful scenes, including breathtaking mountain views, waterfalls, views of the Cove, historic buildings, and beautiful plants and wildlife all around! For more information about the trails, visit the Cades Cove Visitor’s Center. “Deer are almost always sighted in the fields, and observations of other wildlife, including bear, Wild Turkey, and fox are possible. Please use pullouts when viewing wildlife and never approach or feed animals.” Cades Cove Loop Road is your chance for a Smoky Mountain Safari! Just drive through the park at a leisurely pace, and whenever you see wildlife that peeks your interest, pull you car over to the side, and view all God’s creatures from the comfort of your car! Or get out for a better view, but don’t approach wild animals! There are also horses in Cades Cove, which are a bit more approachable! “A wide array of historic buildings dating back to the late 19th and early 20th centuries is scattered through-out the cove. These include a grist mill, a variety of barns, three churches, and a marvelous collection of log homes and outbuildings.” I love looking at historic buildings, especially in Appalachia! Something about it just makes my heart come alive! We’re sure you can see why we love Cades Cove, and we hope you’ll stop by to see us, and the Cove, very soon! In honor of Earth Day, we would like to present a few ways that you can help preserve the environment, as well as the cultural and economic health of your chosen travel destination, by “green-ing” your vacation! Of course, using a car that gets the best gas-mileage is an obvious way to conserve precious resources! Also, if you choose to rent a car, the rental companies are getting better and better about offering green choices, just ask them about it when you are looking into renting a car! If you choose to fly… believe it or not, the bigger the better! The more people that can fit on that plane, the less fuel per person is used! And perhaps a choice you haven’t thought of- take the train! Amtrak is adding more lines all the time, and getting more and more reliable as well! There are a couple of ways you can make green choices for lodging! First of all, choose a company that is locally owned. That way your money is going to preserve and build up the local economy! Secondly, choose lodging that has done as little damage as possible to its surrounding environment in the process of being built. Renting a cabin in the Smokies is a great example of this, as cabins are built to nestle you right into the surrounding beauty of nature! Thirdly, choose a lodging company that is striving to go green in their business practices. ERA in the Smokies is striving to go green in several ways! A few examples… we have seriously cut down on paper waste, both by going digital with the great majority of our advertising, and by reusing scrap paper as much as possible. We also choose environmentally friendly cleaning products as much as possible, and strive to cut down our energy consumption with utilities as much as we can! A fourth way you can go green with your lodging choices is by doing YOUR best to avoid wasting precious resources! Don’t leave the water running while brushing your teeth… even on vacation! Well your food doesn’t literally have to be the color green! But you can make green choices when it comes to your food, even while on vacation. When you eat out, choose local restaurants. More and more restaurants are hiring locals, buying their supplies, both edible and otherwise, locally, even buying organic foods, composting, and conserving energy and resources any way they can! Our Smoky Mountain community has many locally owned, unique, and delicious eateries! What better place to enjoy nature than the lush Great Smoky Mountains?! The Great Smoky Mountains National Park boasts 1,600 species of flowering plants, 450 species of non-flowering plants, 66 species of mammals, over 200 varieties of birds, 50 native fish species, and more than 80 types of reptiles and amphibians. And this lush nature is not limited to the park itself! There are any number if ways to enjoy the great outdoors in the Smoky Mountain area! From hiking, to kayaking and canoeing, from whitewater rafting to enjoying a picnic outside, the sky is your limit!